Employers Guide to ADA Manual - Get Critical Information to Help You Comply with The Americans with Disabilities Act - J.J. Keller & Associates, Inc. Employers Guide to ADA Manual - Get Critical Information to Help You Comply with The Americans with Disabilities Act - J.J. Keller & Associates, Inc. by J. J. Keller & Associates, Inc. at In The National Interest. MPN: 14700. Hurry! Limited time offer. Offer valid only while supplies last. J. J. Keller & Associates, Inc. 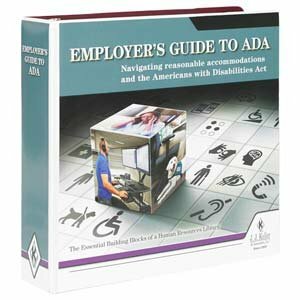 Employers Guide to ADA Manual - Get critical information to help you comply with the Americans with Disabilities Act. J. J. Keller & Associates, Inc. Employers Guide to ADA Manual - Get critical information to help you comply with the Americans with Disabilities Act. 564 Pages. Copyright 2017. Manufacturer: J. J. Keller & Associates, Inc. Brand: J. J. Keller & Associates, Inc. Publisher: J. J. Keller & Associates, Inc. Studio: J. J. Keller & Associates, Inc. If you have any questions about this product by J. J. Keller & Associates, Inc., contact us by completing and submitting the form below. If you are looking for a specif part number, please include it with your message.